Thousand-year-old “koma” chess pieces from Kashihara city, Nara prefecture, 17 pieces in all, including a “king” piece — these are the earliest shogi game pieces ever found in Japan. Shogi is the most popular form of chess and board game played in Japan. Shōgi means general’s (shō 将) board game (gi 棋). The earliest predecessor of the game, is thought to have been chaturanga, of Indian origins from the 6th century, which spread throughout the continent of Eurasia, developing into many variants of chess games. In the West, it became chess. In China, it became known as xiangqi (象棋), on the Korean Peninsula as janggi (장기), and in Thailand as makruk or makluk in South-East Asia. 10th to 12th centuries Chinese variant of chess, xiangqi, are believed to have emerged in Japan, spawning local variants of the game. Shogi in its present form with the “drop rule” was played as early as the 16th century, with a direct ancestor without the “drop rule” was recorded from 1210 in a historical document Nichūreki, which is an edited copy of Shōchūreki and Kaichūreki from the late Heian period (c. 1120). The said shogi 玉将 or koma pieces — 18 white and 19 black shogi koma pieces, were found in Kashihara city, at the Fujiwara-kyo or Fujiwara Palace (682-710). This form of shogi is considered the prototype of the shogi game played in Japan today. The oldest archaeological evidence, pictured above, is the group of 17 shogi pieces excavated from the grounds of Kōfuku-ji (founded in 669) in Nara Prefecture. The finds were physically associated with a wooden tablet written on in the sixth year of Tenki (1058), so that the shogi pieces are thought to date from that period. 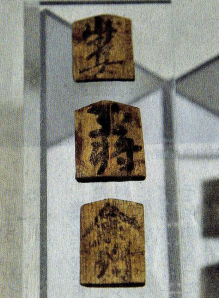 The simple shogi pieces were cut from a writing plaque in the same five-sided shape as modern pieces, with the names of the pieces written on them. Oral tradition has it that shogi was invented by Yuwen Yong of Northern Zhou, and that Kibi no Makibi (吉備真備) brought it back after visiting the country of Tang. One of the oldest documents indicating the existence of shogi is Kirinshō (麒麟抄), written by Fujiwara Yukinari (藤原行成) (972 – 1027), a seven-volume work which contains a description of how to write the characters used for shogi pieces, but it is thought that the shogi section may have been added by a writer from a later generation. The earliest generally accepted mention of shogi is Shin Saru Gakuki (新猿楽記?) (1058–1064) by Fujiwara Akihira. It contains passages relating to shogi, and is regarded as the earliest document on the subject. The fact that a go-board exists in the collection of the Nara Period Shosoin Treasure House, but not shogi boards or koma pieces, is thought to be negative evidence indicating that shogi had not emerged in Japan by that time. Ivory shogi pieces and lacquered board from the 16th century that turned up in Fukui prefecture have earlier captured the media spotlight.